If you’re looking for a solution in a hurry, just skip to the bottom and read A Very Simple Solution. I have a long-time client whose team uses Visio as part of their extensive documentation processes. A lot of the work involves bringing images, screenshots together on a Visio page, adding notations and other vector-based elements, then exporting the results as SVG and PNG for further manipulation by their content management system. Recently it was brought to my attention that they were having trouble with mathematical equations. While they create the equations with no problems in Microsoft Word, they were having trouble getting those equations into the SVG step of their process. My client described a convoluted process with lots of details I didn’t follow. I remember her emitting a lengthy stream gibberish (which she politely apologized for). However, I did recognize some terms like “import”, “MathML“, “convert”, “Oxygen”. Adding some behind-the-scenes data to the image shape. This would be OMath XML which Word uses to describe equations. … because I noticed something. When I deleted the ugly [?][?][?][?][?][?][?] 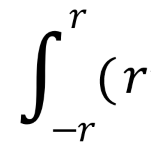 shape, I noticed that for a split second, the proper equation appeared. Then the shape was gone. “Hmm”, I thought. “The properly-imported equation seems to be underneath that mess of question marks. You can just see it before the shape vanishes on delete. “Maybe the import isn’t completely munged, it just has extra junk!” This got the gears turning in my head. 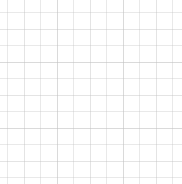 Let’s try converting the ugly metafile into Visio shapes. You can do this to metafiles by simply ungrouping the shape. 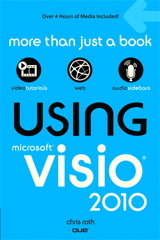 Visio will attempt to convert foreign objects into Visio shapes, wherever possible. And VOILA! I got a decent equation, made up of separate Visio text shapes and lines. Well almost. The fraction line is off, and the integral sign and parentheses are missing. This is fairly easily remedied. I fired up Character Map, chose the font Cambria Math, then found the missing characters. I copied them, then pasted them into some of the blank shapes that resulted from the conversion (see the dark-blue, vertical bars amongst the selected shapes). So it’s not perfect, but it’s better than running through a bunch of conversion applications, I guess. 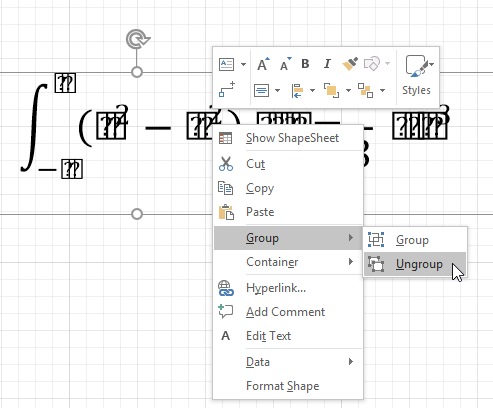 Your equation magically appears as Visio text and lines! 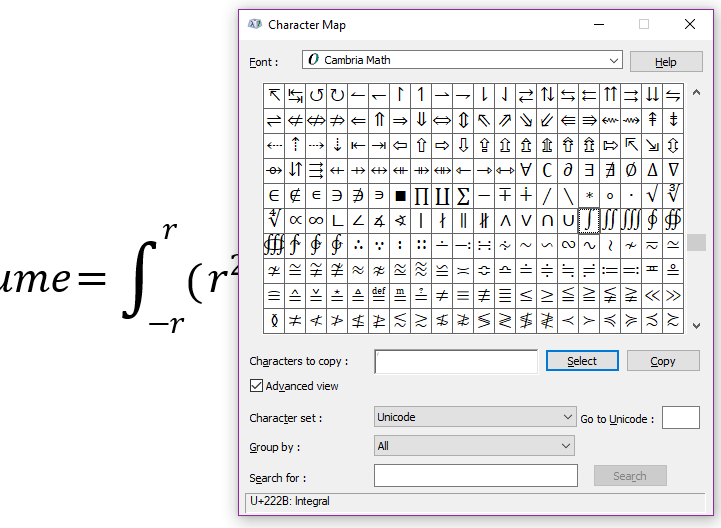 Use Character Map and the Cambria Math font to replace any characters that didn’t copy over. The method isn’t 100% effective, as some symbols seem to be ignored. Over time, you could build up a library of missing symbols to have at the ready, since they’re just characters in a special font. While investigating this scenario, I ran across some interesting tidbits regarding equation markup that I’d like to share. Microsoft Word uses an xml format called OMath XML to describe its equations. But there seems to be another major standard called MathML. See this thread on Office DevCenter. It is possible to have equation-text within an SVG block, although in the past, it wasn’t possible. The trick seems to be to use a <foreignObject> element within your SVG. Within the foreignObject tag, you will create a <math> tag to hold your equation markup. This site has some nice explanations and examples: MathML in SVG. 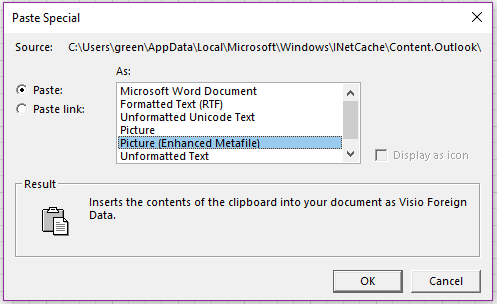 Be ready with your finger on F12 so you can inspect the markup! W3.org has a nice, short introduction page for MathML, check out What is MathML? Mozilla, of course, has the MathML Reference. My client referenced an XML editor called Oxygen XML Editor (not free). They use it as part of their workflow. I thought I’d mention it here, as it can apparently be used to work with MathML. I didn’t look into it further. If you want to go from Word to SVG, then you’ll want to convert OMML to MathML. One place to start is the MathType Software Development Kit. In particular, look for the ConvertEquations sample application. I found an aging article that contrasts MathML and OMML on Microsoft Developer, have a look at MathML and Ecma Math (OMML).